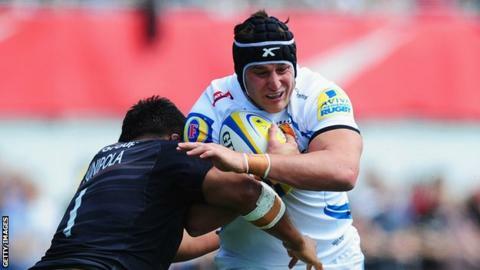 Exeter Chiefs forward Mitch Lees has signed a new deal which will keep him with the Premiership club until 2017. Australian back-rower Lees signed for Exeter from Championship side London Welsh in April 2014. The 26-year-old made 24 appearances last season, as Chiefs narrowly missed out on a Premiership play-off spot. "We feel there is still a lot of development in him and we have only scratched the surface with him," head coach Rob Baxter told the club website. "He has not been in a professional training environment for very long, but he is obviously a big guy and he is a very good rugby player. "He had a very good first season for us, so we moved very early to extend his contract for the next two years."